The Owners Opinion: Farewell to Denman. A Truly Great Horse and the End of a Magnificent NH Era. Farewell to Denman. A Truly Great Horse and the End of a Magnificent NH Era. When I was a kid, growing up in Chester, the wonder horse Arkle was owned by the Duchess of Westminster and would spend holiday time on the Eaton Estate just outside my home town. He was probably the first racehorse that I readily identified with, and although memories of his races have only really come from grainy TV recordings, it was his ability to win under huge weights in handicaps that for me made him a true champion. Only one horse since has made such an impression, and that was the mighty Denman, who passed away on Tuesday 5th June. By the early part of the new century I was living just outside Lambourn and always went to the Newbury meetings. I’ll never forget Denman’s unbelievable performance in the Hennessy Gold Cup on 1st December 2007. Without any doubt it was the best handicap performance I’ve ever seen in my life. Brutal and magnificent in equal measure. He destroyed a top-quality field (and earned an amazing OR of 182 in the process, which puts it into perspective), thoroughly deserving his nickname of “The Tank”. Racing Post journalist Tom Kerr wrote a magnificent article in the Racing Post and I reproduce it with full acknowledgements below. I couldn’t agree more with Tom in his comments about the horse and his contribution to promoting our wonderful sport. It has been a mere ten years since Denman wrote his name indelibly into racing history as he steamed in all his fury to 2008 Gold Cup victory; just seven since he and Kauto Star chased home Long Run in that glorious last hurrah at Cheltenham in 2011. 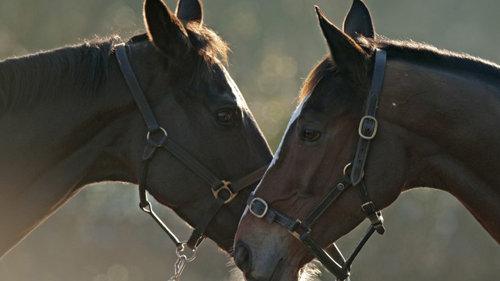 It is hard to believe that now both halves of that great rivalry are no more already, but while an era ended with Denman's death this week the legacy of those two great horses will echo down the decades. No one who saw the two titans in all their pomp will ever forget them. They will provide us with anecdotes long into the future, give us stories with which to bore future generations as they obsess over the next bright young thing, until, at last, when all of us who saw them run turn to dust, Denman and Kauto Star pass into the ranks of legend – long gone stars whose light still flickers in the dead of night. Perhaps the greatest service those two horses gave racing was in how they drew to the sport a generation of fans who might otherwise never have fallen under its spell. Not since Desert Orchid has there been a horse who captivated a new generation as did Kauto Star and Denman and none, not even Frankel, has achieved such a feat since. I was part of that generation and without those two horses, their soaring performances and their enduring rivalry, my journey through life would have been so much the poorer. There are countless thousands of us out there who were introduced to racing's glory by their exploits and their tussles. Everyone drawn into the sport by Denman, and they are legion, will have their own moment of indoctrination: perhaps it came during his first Hennessy in 2007, when he lugged top weight around Newbury and pulled up the trees as he swept away his opposition. Perhaps it was that 2008 Gold Cup, which I hold to be one of the finest races of all time, for all that I lost almost every penny I had punting Kauto Star for the months leading up to it. Maybe it came later, when he overcame a heart scare to win that emotional second Hennessy and run heroic placed efforts in the Gold Cup. I still recall the dawning realisation that racing was more than just a fun day out and an engaging way to bet a few quid, that instead it was a world of epic heroes, mud-splattered beasts that seemed to have leapt from the pages of ancient lore into our sterile modern world. Only horses like Kauto Star and Denman can awaken such thoughts. By the very nature of being once-in-a-generation horses, animals like that do not come around often. The Red Rums, the Dessies, the Dancing Braves, the Frankels, the Secretariats, the American Pharoahs – it is their scarcity that makes them so intoxicating to watch and follow. They are the Usain Bolts, the Muhammad Alis, the George Bests, the Roger Federers of our sport. Yet when they do roll around, that once in a decade moment when a superstar emerges out of obscurity to light up our lives for a short few years, they revitalise the sport, bringing into the racing fold thousands of new believers. We can market the sport every way we like, tinker with conventions and conditions to our hearts' content, but nothing will ever change the fact that it is equine heroes who drive racing. This is the fundamental flaw of so many marketing wheezes dreamt up to promote racing. They are all very well in and of themselves, and some do have a positive impact, but racing's appeal – at least as sport rather than a betting medium – rests heavily on the exploits of its most talented equine stars. Take the mooted Championship Horse Racing enterprise, which is scheduled to begin next summer and will supposedly invigorate the sport by bringing team sensibilities to racing, with sponsored Formula 1-style sides of trainers, horses and jockeys competing against each other over several weeks. Kauto Star and Denman inspired ferocious loyalty and dedicated followings, the like of which has not been seen in racing for decades and may not occur again for a generation, despite living side by side, despite sharing the same trainer, despite sharing three jockeys over their career. They created that passion by simply being the best, by inspiring awe, by being something that so many of us had never seen before. Now, too soon, they are gone. We should not mourn what we have lost, but celebrate all that they gave us – passions to last a lifetime, memories to last forever.